Sierra Leone has long been a focus of Beijing for aggressive investment due to the West African country’s rich mineral resources, which include diamonds, gold, iron ore, and bauxite. Recently, the actual benefits of Chinese investment have been a subject of debate in the Sierra Leone government, which led to the termination of an international airport project that was to be financed by China. Kabineh Kallon, Sierra Leone’s transport and aviation minister, said in a letter dated Oct. 5 addressed to the director of the project that the government would end the contract to build the Mamamah International Airport as of the end of this month, according to Sierra Leone newspaper the Sierra Leone Telegraph. Mamamah is a small town on the outskirts of the country’s capital Freetown. Soon after the deal was signed by Sierra Leone’s president in March, China’s state-run China Railway International Group began work on the airport, with financing from China’s state-owned Export-Import Bank of China, according to Sierra Leone newspaper the Concord Times. The existing Lungi International Airport is the only international airport in Sierra Leone. According to the Sierra Leone Telegraph, critics of the Mamamah airport project, including the World Bank, say that Lungi International Airport has been struggling to reach full capacity, due to the low number of international travelers. According to the Sierra Leone Telegraph, Lungi International Airport has recently been redeveloped with over $200 million in funding from the World Bank. Former Sierra Leone President Ernest Bai Koroma signed the Mamamah project after four years of negotiations. According to the Sierra Leone Telegraph, Mamamah was Koroma’s political heartland. But soon after the airport deal was brokered, Koroma’s political party, All People’s Congress (APC), and its presidential nominee, Samura Kamara, lost to its rival party, the Sierra Leone People’s Party and its nominee, Julius Maada Bio, during the general election that same month. Bio is the current president. Sierra Leone has accumulated more than $220 million of debt to China in the past 10 years, according to data from the Johns Hopkins China-Africa Research Initiative. Many countries, including South Africa, Kenya, Sri Lanka, and the Maldives are currently saddled with enormous debt to China. Locals have accused Beijing of putting their countries into “debt traps,” after servicing loans for expensive infrastructure projects. The Johns Hopkins China-Africa Research Initiative estimates that African nations, as a whole, owe China about $130 billion. However, scrapping the Mamamah project doesn’t mean Bio will stop taking out more loans—including more from China. According to Sierra Leone’s official government website, on August 31, Bio spoke to Song Dongsheng, president of China’s state-owned PowerChina International Group, on Aug. 31, about whether the company could finance the construction of a bridge connecting Lungi International Airport and Freetown. Various Sierra Leone media estimate the bridge’s cost at about $1.3 billion. Beijing’s investment has led to its open interference in Sierra Leone’s politics, for the purpose of gaining access to the country’s mineral riches. Prior to the general election in March, the Sierra Leone Telegraph reported in February that Chinese citizens living in Sierra Leone recently openly campaigned alongside APC’s leaders and supporters—many of whom support China’s investments. Beijing was accused of bankrolling the APC election campaign. The CCP had previously influenced another APC leader, former President Siaka Stevens, during the 1970s. Stevens later established a one-party state, which paved the way for authoritarianism, corruption, and regionalism, and eventually led to a decade-long civil war that finally ended in 2002, according to the article. Chinese political meddling was a sign of “their desperation to exploit the country’s mineral resources,” according to an article the Sierra Leone Telegraph published in February. For example, in 2011, China’s state-run Shandong Iron and Steel Group bought a 25 percent stake in the Tonkolili iron ore mine, the second-largest iron ore mine in Africa and one of the largest magnetite deposits in the world, according to Reuters. Less than four years later, the Chinese firm acquired the remaining 75 percent, to replace ownership from the London-listed African Minerals, the largest iron ore mining company in Sierra Leone. Natural resources now make up China’s chief imports from Sierra Leone, according to data from China’s Ministry of Foreign Affairs. Of the total $340 million value of imports, most were iron ore, timber, and diamonds. Brima Kamara, a local police spokesman, said that men, girls, and boys were subjected to inhumane working conditions, including working in tunnels. In 2017, the U.S. Department of Labor issued a report on child labor and forced labor in Sierra Leone. 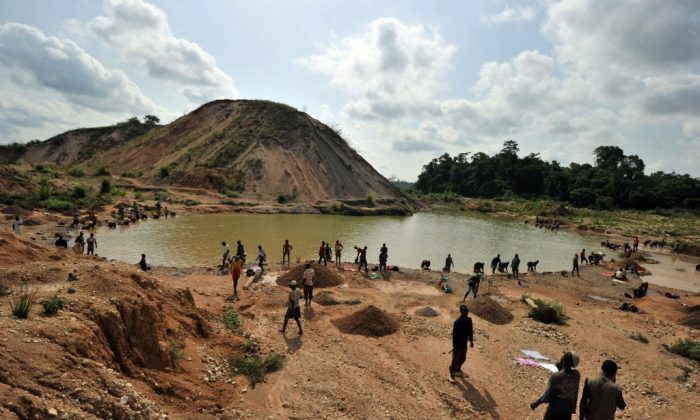 Due to the lack of coordination and limited funding for law enforcement personnel, the West African country is “a source, transit, and destination country for children trafficked for forced labor in domestic work, granite and diamond mining, and begging,” the report said. There were also incidences of child trafficking for commercial sexual exploitation.